Motivate, inspire and engage your team with a speaking engagement by CourtSide® Consulting. 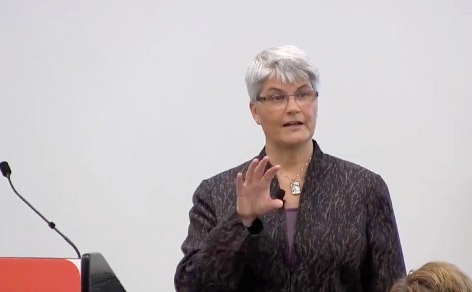 Courtney Berg, CourtSide® founder and renowned national speaker, combines more than 30 years of HR and operations experience with humor to deliver a program that will educate and inspire your employees. Courtney conveys complex HR and employment concepts in an easy-to-understand and engaging way that sparks interest and invokes the audiences' full attention. Whether you are a companyof 5 or 500, your employees will leave a session with Courtney with new energy for their roles because she has not only entertained them but also armed them with practical HR solutions they can implement right away. Courtney's extensive and varied experience makes her exceptionally qualified to help you tackle any problem. From working in a family owned furniture store to running a one person HR department for a 350 employee company, Courtney has seen it all. She has worked to develop practical HR systems in small businesses around the country and wants to share her expertise with you. 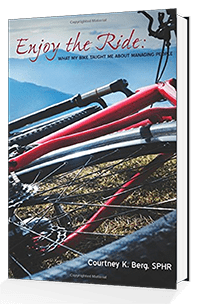 FREE copies of her book, Enjoy the Ride: What My Bike Taught Me About Managing People. 60 minute private consultation to get Courtney's insights on your toughest HR issues. Tools that can be put to use immediately upon return to business. Courtney is a sought-after national speaker. When polled in speaker evaluations, 99 percent of respondents said they wanted Courtney to speak again at their conference or meeting. Whether your event is a national association meeting, a small business organization meeting, a corporate event or a civic business forum, Courtney can deliver a program that will be relevant and compelling to your audience. Debra Hepler, a non-profit director, bought Enjoy The Ride for her management team. Through the tools in the book, her team is able to effectively hire the right people for the right jobs at the right time. In 2018, renowned HR speaker is bringing three incredible sessions guaranteed to provide the tools needed to solve your HR problems. Each speaking engagement is customized to the business and industry, but focuses on key areas for strategic improvement. Trusting your team members to get things done and make wise decisions is imperative to the success of the Practice. Building that trust takes time. Teams must support each other as they create a work environment that fosters autonomy, responsibility, honesty, and respect. Courtney takes boring HR concepts, adds humor and practical experience to bring you the information you will use the minute you leave the room. Customers know what they want. They have many choices and you want them to enjoy your company so much that they will tell their friends! Your staff is the key. How customers are treated by your staff can make or break the customer experience. Sometimes it is the smallest staff interaction that will be the difference between a customer being delighted or never returning at all. How you hire, train, manage and terminate your staff is paramount to your success. This seminar will provide you with easy-to-use tools to improve your staff’s performance and therefore your customers’ experience. Some questions to ask in the interview to find the right staff member for your culture. The three keys to training your staff. How to communicate your expectations and hold your employees accountable. How to terminate employees without destroying their self-worth.